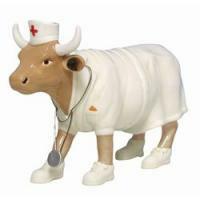 Nurse Nightencow | CowParade New Figurines | One Price Low Flat Shipping! From the Cow Parade Medium Sized Collection, Nurse Nightencow. Sponsor: Sierra Health Services. Featured at the CowParade Las Vegas 2002 exhibit. Made of ceramic. Measures 4" x 6"
This CowParade cow is dressed up in a traditional white nurse's uniform, complete with matching shoes, cap, and stethoscope!